Valve lifter noise and Mega Power Valve Treatment that ends that problem for good! Engine noise add-n-drive additive products that stop their tapping in minutes shown here! The mechanic's repair way. The common method is to pay a mechanic to dismantle the top half of your motor. Dirty valve parts removed require machining to clean-them-up. Deeper in the motor your motor's many hydraulic lifters are yank out like a dentist pulling teeth, new lifters installed, and your motor reassembled, as the fix. Cost $3500. The other way is to install a new product called Mega Power - shown below. Mega Power works using a new breed of problem-solving chemistry that goes where even synthetic oil can't go. Its 6 ingredients of very powerful cleaners, conditioners, and valve lifter noise ending friction modifiers stops valve lifter tap fast. See Demo. What you should know...Know the following and protect your cars and your cash reserve. Trouble starts long before the tap appears. It starts as extremely hot combustion "blows-and by" escapes as you operate your motor, by slipping pass the pistons - see downward arrows. When minute amounts of residue blocks oil to the lifters, the lifter piston drops and a space appears. With each rotation of the engine, the lifter closes the newly-appeared space with a hammer-like blow you hear as a tap tap tap. That tap is not good, of course. Blowby, residues and sludge are trouble makers that Mega Power will remove - because oil can't! Our method is offered in the recommendations below. Location of valve lifter noise and How Mega Power Valve Treatment ends the problem for good! What are ways to end their tapping? Oil changes and part store additives have until now, not been able to correct the problem until Mega Power valve treatment was invented. It works because it cleans and frees the lifter and this restores quiet operation again. Mega Power works well in transmissions, radiators and steering systems to end their wear and residue caused problems. Mega Power is installed prior, and during fluid replacements detailed below. Or causes the adjuster to drop. Both problems creates a space and the tap as they bang against each other related part. So, if not dirty valves, its your motor's dirty valve lifters sticking such, a space occurs, causing the tap. Using Mega Power you clean and free all 3 areas of the tap ends your motor valve lifter noise and tapping. Dirty rings, valves, and lifters indicates the dirtiness is about to cut your engine life in half! You don't want to go there, do you? No! The tap is caused by another dirty condition called "blowby"
You can blame your tapping and years shorter engine life from dirty, lazy piston rings. They allow boiling-hot 500 degree combustion gases to slip pass your motor's piston's, to mix-in with your motor's oil. Sound good to you? No, its not! Oil break-down forms [a sludge], circulating in a gravy-like goo. The Mega Power Valve Treatment uses 6 items to get to, and remove what the best oils cannot - They cannot remove sticky residues on piston rings, motor valves, and valve lifter adjusters. The best oil cannot end blow-by and your tap problem. Mega Power has made it easy to correct this problem. Is that what your after? Order Mega Power below. The install of Mega Power is simple, although Mega Power performs a complex, Hi-tech cleaning and freeing action, no synthetic oil can ever do. 3 Mega Power items shown go in the top gas, air and combustion side of the motor, and 3 into the motor's oil during an oil change, to end your tap work. A remedy that ends the tap when nothing else can. No special skill needed, nothing to take apart. Just add as directed, and driving does the fix, quieting the tap - guaranteed! Picture shows engine torn apart to replace valve lifter noise causing parts. Mega Power comes by FedEx to your door in about 3 days, with easy-to-follow directions, phone help if needed, and our guarantee. You can order the Mega Power Valve Treatment below. Order one Mega Power Valve Treatment. Includes 6 items shown. Easy-to-follow directions. Phone help if wanted. Satisfaction Guarantee. Shipped to your door by FedEx in 3 days. Just $75, plus $15 s&h= $90 total. Order 6 Mega Power Treatments to service 6 motors. Fleet or mechanics resale value. 36 items. $300+ $20s&h=$320 total. Not $450. Order now! Save $130. Mega Power stops engine valve lifter noise for a smoother quiet running motor - at 1/10th the cost of repair. Order 2 treatments and protect both car motors. Just $140 Save$40 on this springtime special. Before your shown the directions - consider this.irections below. 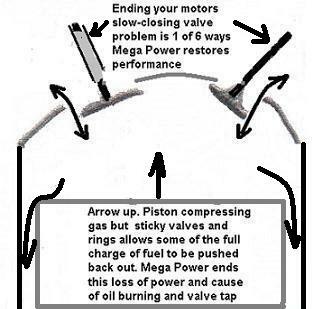 Blowby means raw gas and hot acidic combustion blows from above your motors dirty, sluggish piston rings -This loss not only lowers horsepower, it also gums up critical parts - once clean an freely moving. Blowby is 800 degrees hot an cooks your oil into tar. With acids and sticky residues valve lifter noise results. On valves, see picture, Sticky residues bog down valve closing speed. A space then appears and you hear your motor parts close the space with hammer like tap. You now know more about valves, and why valve lifter noise occurs and the reason for your cars tap than your mechanic! Do you want to just use his older, traditional method to fix the problem with a $3500+ engine overhaul? The other way is to install a new product called Mega Power. Mega Power works using a new breed of problem solving chemistry that goes where even synthetic oil can't go. Its 6 item ingredients of very powerful cleaners, conditioners, an valve lifter noise ending friction modifiers. Anyone can easily install Mega Power to end their motor tap an, if they want to avoid transmission trouble, also clean their transmission shift valves with Mega Power. Mega Power avoids rough shifting - really! Just like Mega Power's valve treatment shown here, does. Mega Power is the other, smarter, cheaper, faster way to end your valve lifter noise. Cost: $250 if your mechanic installs it. $100, if you install it yourself. Guaranteed! The Mega Power Valve Lifter Treatment installs easily to clean and free your stuck or sluggish valve or lifter tap condition - and the cause of the tap - sometimes in a few minutes, to a day of driving, customers tell us. That's my experience, too! And the best part - with this valve lifter tapping remedy, there is nothing to take apart! Driving does the fix!Simple to follow Directions: The valve treatment works in 2 steps like this.Step One. You add 3 items for top of motor valve cleaning. One to the gas tank, to the oil, and vacuum for top of the motor valve cleaning. Drive as usual.Step Two. A week later you add the 3 remaining items during an oil change. That takes away the cause of the problem and smooth, very powerful quiet smoothness - amazingly returns!Pretty simple for a complex problem. These 6 items work together from 6 directions found to clean, condition and end the tap. Driving does the actual fix. Most times, the tap stops right away. Total cleaning of the 2 steps ends the problem permanently. Mega Power will add years more quiet, dependable life to your motor at a much lower expense than repair, at $250 if a mechanic installs it for you. Under $100 if you install it yourself. If you read this far, you need to order Mega Power. Order online or by phone.Ends valve lifter noise. Mega Power will add years more quiet, dependable life to your motor at a much lower expense than repair, at $250 if a mechanic installs it for you. Under $100 if you install it yourself. If you read this far, you need to order Mega Power. Order online or by phone. How valve lifter noise or tap starts. You can blame valve lifter noise, and its tapping sound - and years-shorter engine life, and transmission life -for that matter, on combustion temperatures - about 1800 degrees, and acids that form from components in diesel and gas and motor oils. With heat and combustion escaping down pass your pistons into your oil, - acids, residue sand friction form to cause tapping. As a mechanic, taking motors apart, you see 3 things happen Mega Power does to end valve lifter noise. New types of cleaners, conditioners an acid neutralizers, along with co-polymers - covered below, from Mega Power will correct those conditions and mechanic can learn the install process from this article. As a mechanic, taking motors and transmissions apart, you see 3 things happen that cause the valve lifter noise - and rough shift problem. This internal spreading around of residues which then gum up the pistons valves and their lifters. And shift valves. Cause tapping. Acids etch your piston bearing and gear surfaces creating friction. Friction and binding= more friction to wear out your car years faster. That makes engines and transmissions seem worn out, but eye balling them only show roughness and residues. Mega Power Engine and Transmission Treatment clean. heal, smooth and fill worn spaces. This makes a complex problem solver like no other! The motor's PCV system - a device added by law to all engines to curb smog, sends some of the vaporous acids, moisture and un-burnt fuel from the motor oil area, back up into the fuel, air entree stream for re-burning. That's not good for the top of the motor, nor the bottom parts. As Mega Power cleans by vapor action the PVC system - as well as wherever fuel air combustion blowby oil and exhaust go a breathing and cleaner combustion and more horsepower out put results. As your motor's mixture of heat, moisture, and sulfurs spreads into the motors oil, oil breakdown [sludge] forms. Sludge circulates into valve lifters, causing oil blockage - lifters are hydraulic adjusters that use motor oil to take up wear spaces. Solvent engine flush additives, called engine flushes, are often considered as a remedy to end lifter tap. However, they cause engine failure problems. Stay away from those products. The mechanic's repair way. The common method is take apart your engine and have it basically rebuilt. A mechanic dismantles the top half of your motor. Noise causing dirty valve parts are removed, required machining performed to clean-them-up. Deeper in the motor your motor's many hydraulic lifters are yank out like a dentist pulling teeth, and new lifters installed, and your motor reassembled, as the fix. Cost $3500. The other way I like to stop valve lifter noise - and I promote that's cheaper is to install a new product called Mega Power - shown below. Mega Power avoids valve damage in several ways. One way is that it enhances lubrication and oil delivery with its cleaning ingredients. This powerful feature stops valve lifter tap by having the ability to go where oils and other additives cannot. The freeing of stuck valve lifters expands them and closes a gap. This ends the noise and tapping. Is that what you're after? Come back and Read Doug's experience. While I use this web site to train mechanics in this expertise, to increase their customer-pleasing, profit-improving capabilities, I explain its easy install way so you or any non-mechanical man or women car and equipment owner can get the same professional results. So read along and let me introduce the best, easiest, and only product solution known to end your valve lifter noise. It occurs when friction drag and sticky residues jam lifters, or slows down the closing of your engine valves. That jam or unnatural slowness creates a space and your tap! This covers a Mega Power Treatment using 6 items found to stop your troublesome, stuck valve lifter noise makes. Lifters, or adjusters as I call them, one lifter for each of your motor's fuel and exhaust valves, push them open and close - with a cam assistance, to let fuel in, and exhaust out of your motor - a dozen times a minute as you drive down the road. See picture above. That's the first job of a lifter. Because engine valves take the motor's worst punishment under 1800 degree temperatures, even though heavily oiled to cool and lube them, valves wear out the fastest- causing a drop of power and noisy operation - both are worrisome and costly negatives to correct - and avoid, if possible. To overcome the wear factor, engineers designed lifters to have a pencil-eraser size little piston that expands under oils pump pressure to take up wear space as valves wear - to keep power up, and engines quiet operating. The second job of a lifter. 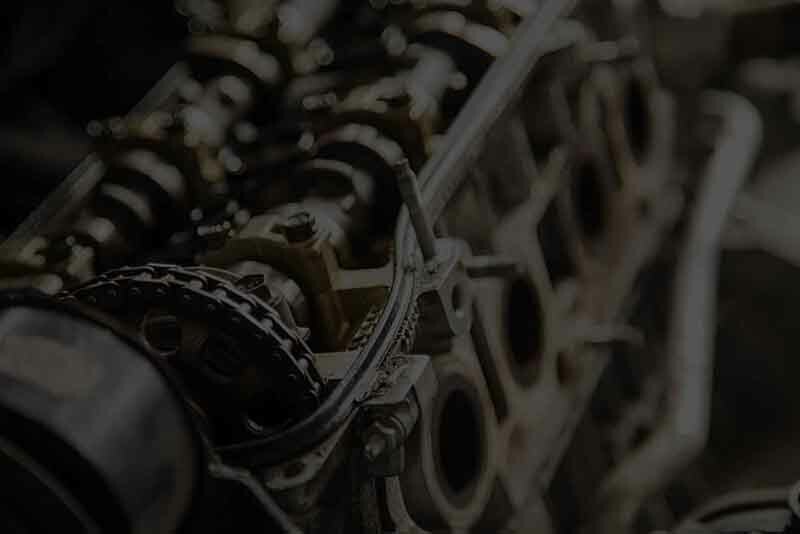 Because many kinds of valves operate to make engines and transmissions and other components work, valves and lifters become troublesome when dirty, worn, and this deters running and shifting and cooling performance negatives you are experiencing. Dirty moving parts is what cause "millions of premature engine and transmission repairs" last year. So says a National Transmission Association Forecast Builtin - about what to expect in the near future also. You can blame valve lifter noise, and its tapping sound - and years-shorter engine life, and shorter transmission life - for that matter, on acidic residues that the motor makes. Just a thin sticky acidic film - which eats away those surfaces, increases friction drag, faster wear increasing problems, and a foothold for residues - without your knowledge - as you start the motor and take off, and drive here and there everyday - until residues and or friction causes the valve lifter noise - or another car and worry producing negative in your life. Many troublemakers. A Mega Power Complete Solution. I'll show you how to end both problems. Sure, you use good oil - but sludge and residues form anyway, create sudden valve lifter noise, and wear out your motor and its power years faster. How so? This results from combustion - about 1800 degrees, and acidic compounds which slip pass the piston, and mix with oil. There, they create residues. What diesel and gas and motor oil filters don't get, coat every piston and gear part. As more heat, acids, and combustion create more varnish and residues some residues travel to and block the valve lifters of oil at the end of the oil supply route. The tap problem happens when lack of oil from blockage causes the adjuster to drop - like a tire with a hole in it, and a space appears. As the space closes on each rotation a hammer-like smack occurs. That is the cause of valve lifter noise and tap tap tap. Good oils can't prevent this problem - though the ads say so! What us mechanics are trained to do to end valve lifter noise. We take your engine apart, clean every part, machine others, and replaces all the lifters - for a $3000 plus cost. How Mega Power Engine Valve Treatment Stops valve lifter noise for good! Mega Power follows a 2 step treatment where acids are neutralized as you add the products to the gas and oil, and a cleaning, freeing operation works as you drive. This returns the motor to its original quiet operation. Imagine that pleasing development! While some part store additives are are sold for valves and cleaning, most are thick honey-like and only muffle the sound, and others use solvents to flush the motor - now proving damaging. Mega Power's method provides a new Hi-tech way to solve the valve lifter noise problem. Doing so with crawling cleaners - 6 of them! That chemically penetrate where oil cannot go to clean and free the lifter. This action opens the passage way - again letting oil pump up the little adjuster in the lifter - closing the gap, returning quiet to the engine again! Besides that, Mega Power 6 ingredients provide other beneficial anti-wear, conditioners, and friction modifiers your motor needs. Their bathing of every part cleans them, frees and coats them, adding a slippery protective film on every part. That Mega Power Product and its Treatment Advantage is what has been found to return the original near new quiet strong operation. That's what you are after, isn't it? With oil free and flowing again the lifter adjuster rises closing the gap - ending the tap as you drive. Mega Power does so at a fraction of the cost of actual repair. Results are permanent. Thousands of car owners have opted for the Mega Power 6 item cleaner below as Mega Power cleans the passage ways and lifters of residues. These 6 items have been found to remove the tap causing residue formation that makes valves and their lifters stick.